This combination of information centre, meeting place and sports facility sits at the foot of an existing building in the heart of the campus. There is an internal link between the bar and the campus bookshop. 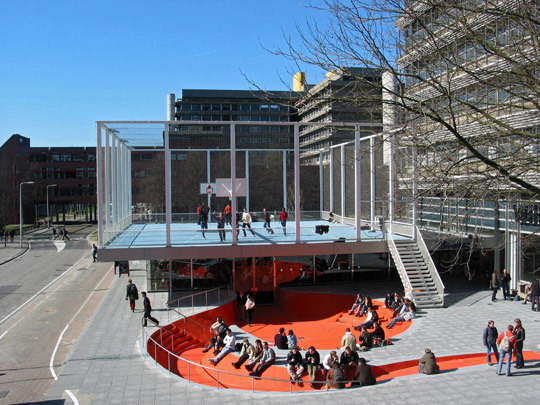 The bar area lies below ground level, its floor giving directly onto the ‘orange pool’, an organically-shaped sunken outdoor terrace whose winding ramp allows disabled visitors to enter. According to the architects, the ambience is that of ‘a cool mixture of people hanging out with drinks, skaters and people in wheelchairs’. Yet the building primary volume is a basketball court with steel wire walls and a glass floor at the centre circle.